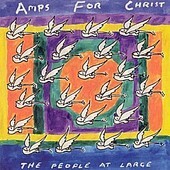 Amps for Christ's The People At Large finds mastermind Henry Barnes further exploring the worlds of traditional and Middle Eastern folk. And, sans a few noise tracks and spoken word poetry pieces, the album's relaxed, true-to-form take and protest format come out sounding authentic. Though, it is during the side-steps that you are left scratching your head, wondering what exactly is going on, those are fewer than the high moments, which make you do a double take and wonder just when, and where this was recorded. I'll give it a C.